High above the Arctic Circle, the north of Norway is one of the most magical winter destinations in the world. Here the snow covers the landscape, mountain peaks dominate the scene and the sparking blue fjords are beguilingly illuminated by the low winter sun. Make the most of an unforgettable journey beyond the Arctic Circle by combining time in Tromsø with the frontier town of Kirkenes – just 15km from the Russian border. This seven-night trip offers ample opportunity for northern lights’ sightings (weather permitting), wonderful winter activities and an overnight at the Kirkenes Snow Hotel. On arrival at Tromsø Langnes airport, you will be transferred to the Scandic Ishavshotel in the centre of the city. Overnight at the Scandic Ishavshotel, Tromso. Day at leisure in Tromsø, the largest city above the Arctic Circle in the Nordic countries and home to a fascinating array of museums and attractions. 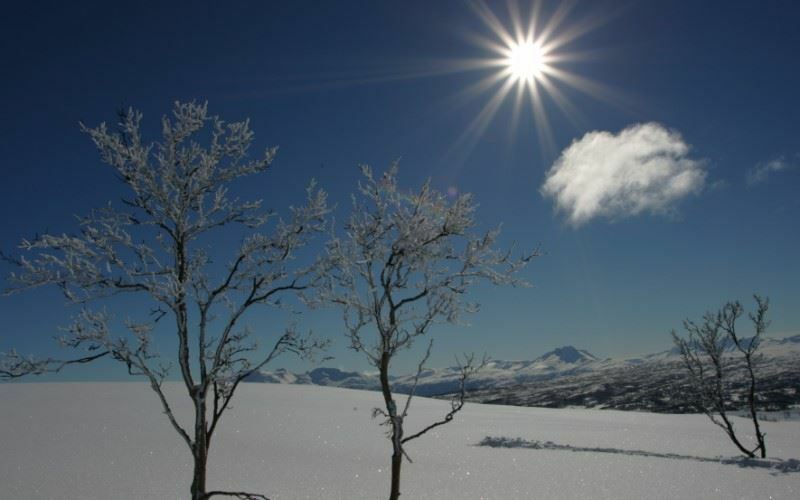 A wealth of winter experiences and activities are also on offer - Aurora hunts, snowmobile excursions, whale watching trips, visits to Tromsø’s ice domes and more - and can be pre-booked by Sunvil on request. This evening we have included a 4 hour dog sled experience that not only takes you away from the artificial lights of Tromsø but that also offers you the opportunity to try your hands at mushing your own husky team. This excursion is a favourite of the Sunvil team. Our suggested itinerary features a 5 hour wildlife, culture and scenery boat tour. This trip, operated by a highly-rated locally-owned company, will explore the fjords and archipelago surrounding Tromsø. The scenery is breathtaking and home to a rich variety of birdlife, so make sure you have your camera ready for pictures. Reindeers and their herders have worked the land surrounding Tromsø for millennia. At Sunvil we pride ourselves on our ability to offer our guests an insight to the real country, and today’s reindeer sled and culture tour is guaranteed to do just that. You will also have the opportunity to try lasso throwing, listen to your local guide’s stories and hear a joik performance. At 18:30 depart Tromsø onboard the Hurtigruten for your cruise northbound to the frontier town of Kirkenes. The journey takes two nights, arriving into Kirkenes at 09:00 on day three and includes stops at Hammerfest and Honninsvag to name but a few of its ports of call - this is the beauty of the Hurtigruten, a service that has breathed life into remote coastal communities for over 100 years. Full Board accommodation is provided onboard the Hurtigruten. On arrival at Kirkenes port you will be transferred to the Kirkenes Snow Hotel, a carefully sculpted structure that takes shape on the outskirts of the town each winter. Wrap up warm in your thermal sleeping bag and enjoy an experience of a lifetime in sub-zero temperatures. Overnight at the Kirkenes Snow Hotel near Kirkenes. King crabs flourish on the floor of the icy Barents Sea and can measure up to 6ft (claw to claw). This is a local delicacy and one which tastes all the better when it is freshly-caught, served without any frills and enjoyed at a wilderness camp around a roaring fire. Overnight and evening meal at the Kirkenes Snow Hotel in a gamme cabin (warm accommodation). Transfer to Kirkenes airport for the return flight to the UK. The Scandic Ishavshotel occupies a privileged and panoramic position in the heart of Tromsø, affording uninterrupted views of the harbour, Tromsø Bridge and iconic Tromsdalen Church (Arctic Cathedral). A location that, in our opinion, is unrivalled. In December each year, on the outskirts of the town of Kirkenes, a remarkable transformation takes place. This is the location of the Kirkenes Snow Hotel, a property made wholly from snow and ice. In December each year, on the outskirts of the town of Kirkenes, a remarkable transformation takes place. This is the location of the Kirkenes Snow Hotel, a property made wholly from snow and ice. Wrap up warm in your thermal sleeping bag and enjoy an experience of a lifetime in sub-zero temperatures, overlooked by individually carved artistic designs in the frozen walls of your bedroom. Rooms can accommodate up to 5 people. 10 Gamme cabins design inspired by Sami fishing and hunting wilderness cabins. Each cabin has a twin bed. Some cabins can take an extra bed for an adult or a child. The Kirkenes Snow Hotel has husky dogs and reindeers living on site and guests can visit the animals.